This Braided Easter Bread has the softest crumb that pulls away like cotton candy. 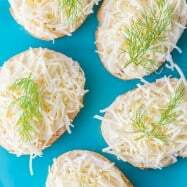 It is laced with farmer cheese (learn how to make farmer cheese with 2 ingredients!) 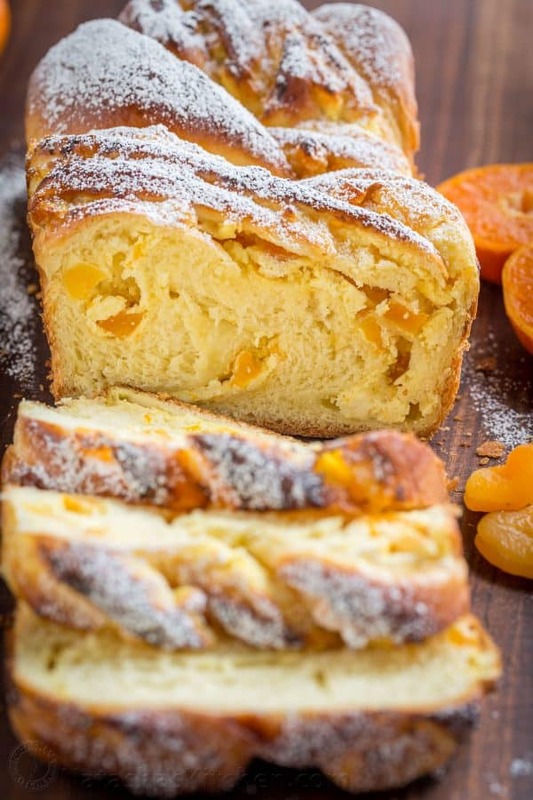 and studded with apricots and orange zest which gives the entire loaf amazing flavor and a tantalizing aroma. 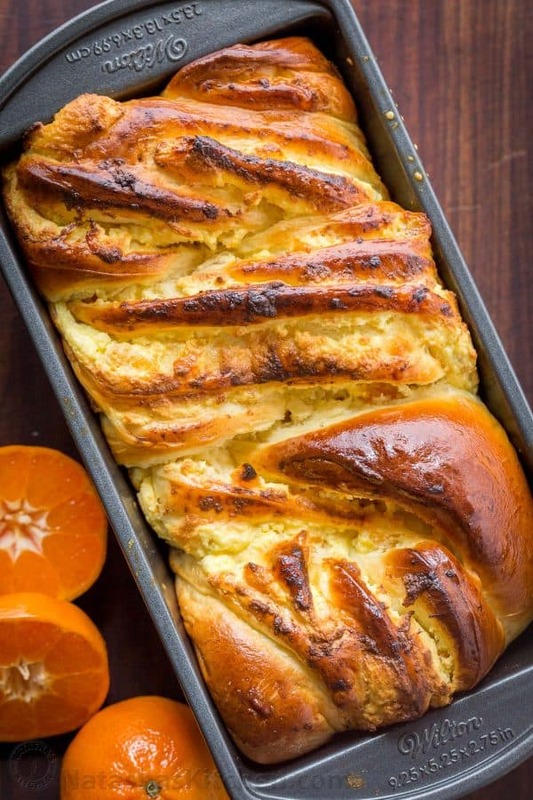 Make this Easter Bread your new Easter tradition! 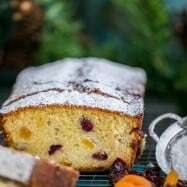 My husband found this recipe on Olya’s Youtube Channel and requested that I re-create! 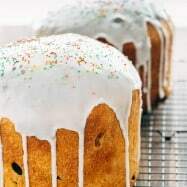 He prefers this over classic Easter Kulich because the cheese gives it exciting flavor and texture. 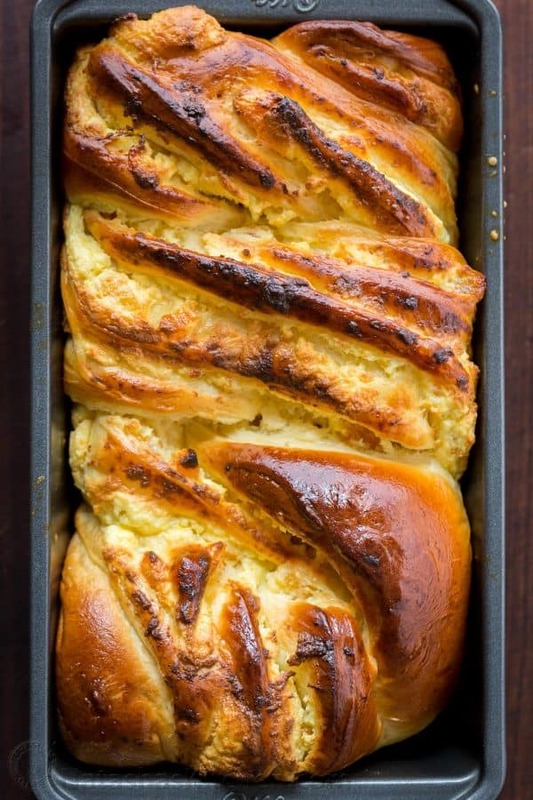 This brings a cheese Paska and Kulich together into 1 impressive Easter bread! *Cooks Tip: In baking, measuring ingredients correctly is crucial. 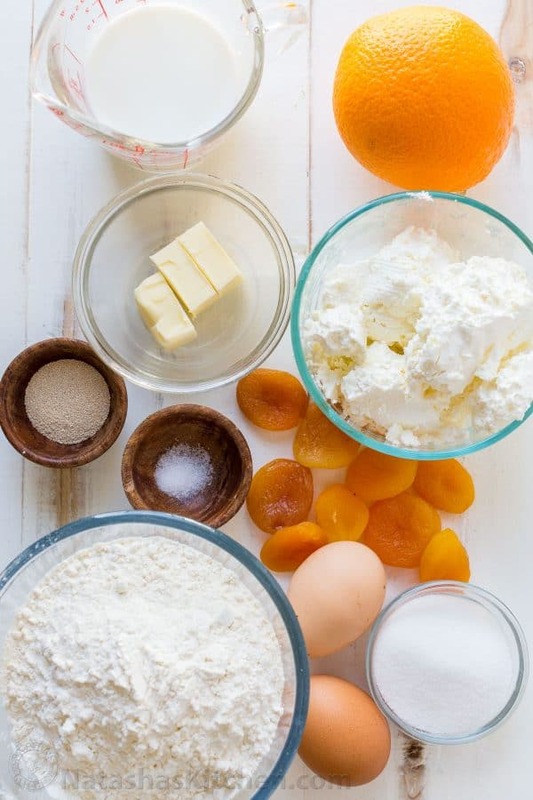 See all of our tips and tricks for measuring correctly and you’ll be baking like a pro! 1. In a measuring cup, Combine 1/2 cup warm (not hot) milk,1 tsp sugar and 1 1/2 tsp yeast. Stir to dissolve sugar and let rest 10 minutes to proof. 2. 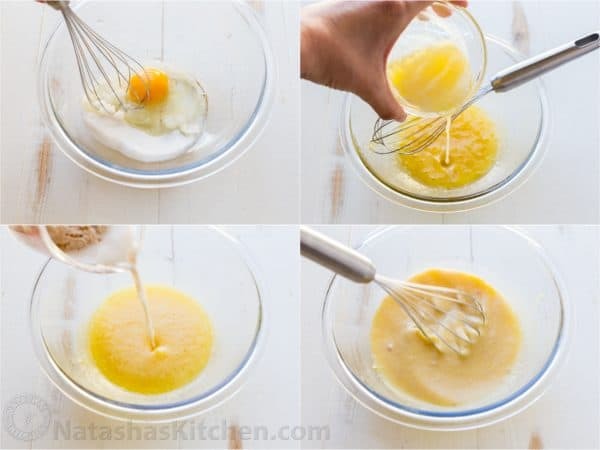 In a small bowl, combine 1 egg with remaining 3 Tbsp sugar and 1/8 tsp salt and whisk together until blended. Whisk in melted warm butter (NOT HOT). Add proofed yeast mixture and whisk to combine. 3. In a large mixing bowl, add 2 1/4 cups flour and add wet ingredients. Stir with a spatula until combined then knead by hand 10 minutes. Dough will be soft and not sticky to the touch. Form dough into a ball then cover the bowl with plastic wrap, and let dough rise at room temperature 1 1/2 to 2 hours, until doubled in size. 1. 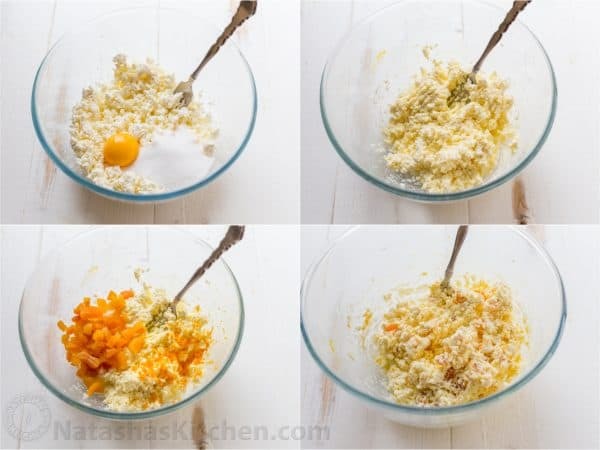 Meanwhile, make cheese filling: In a medium bowl crumble the farmer cheese with a fork. Add 1/4 cup sugar and 1 egg yolk. Use a spatula to blend until combined and somewhat creamy. Add 1/2 cup diced apricots and 2 tsp orange zest. 5. Once dough has risen, punch it down and transfer to a lightly floured work surface. 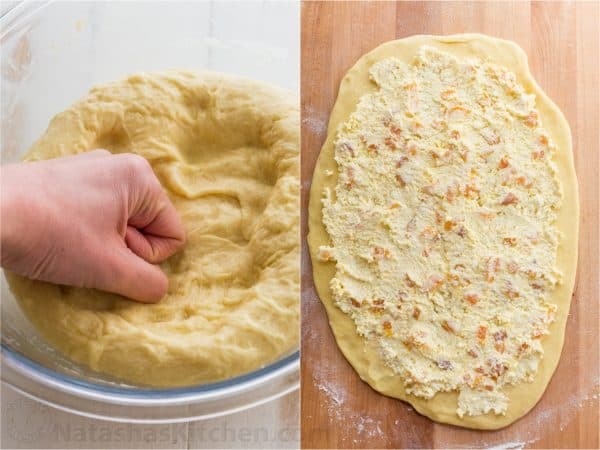 Roll the dough into a 12″x9″ rectangle, between 1/8″ and 1/4″ thick. Add cheese filling and spread evenly leaving 1/2″ of space at the edges. 6. Roll the dough into a log starting from the long end. Pinch the edges to seal. Cut the roll in half to split it into 2 strands, leaving them attached at one end. Overlap the 2 strands starting at the connected end and moving towards the ends, pinching to seal at the end. 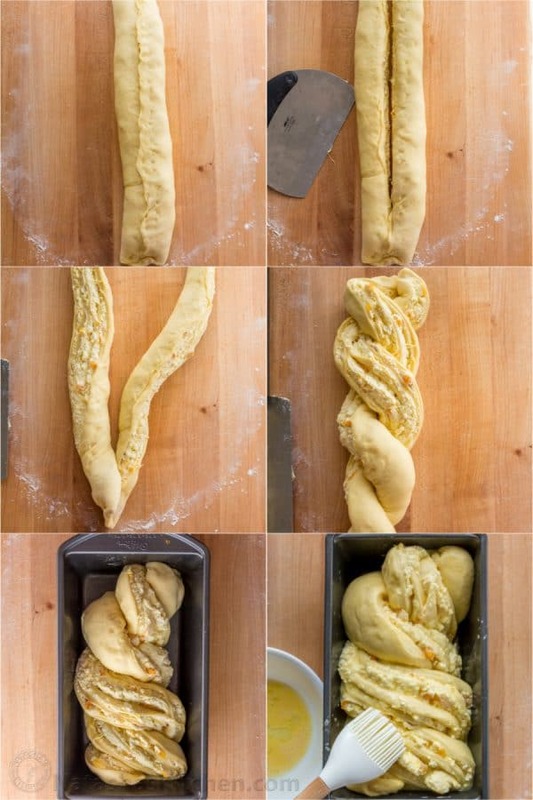 Carefully transfer braid cut-side up to an oiled 9.25×5.25 loaf pan. Cover with plastic wrap and let rest at room temperature 30-45 minutes or until visibly puffed up. Beat 1 egg with 1 tsp water with a fork and brush generously over risen loaf. 7. Bake in center of oven at 350˚F for 35 to 40 minutes. Let rest 5 minutes in the form then transfer to wire rack to cool. Dust warm bread with powdered sugar. Once cooled to room temperature, slice the Easter bread and serve. 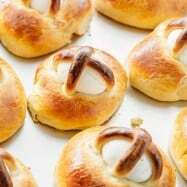 Braided Easter Bread is soft and has a surprise inside! 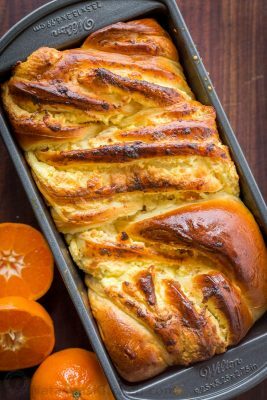 This Easter bread is laced with farmers cheese, apricots, and orange zest which give the loaf amazing flavor and aroma. 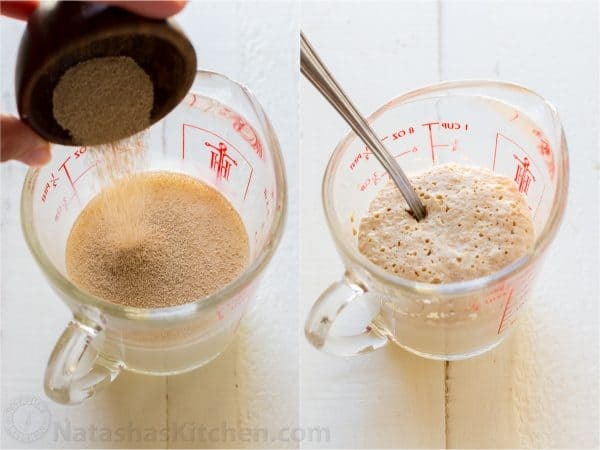 In a measuring cup, Combine 1/2 cup warm milk (not hot),1 tsp sugar and 1 1/2 tsp yeast. Stir to combine and let sit 10 min to proof. In a small bowl, add 1 egg, remaining 3 Tbsp sugar, 1/8 tsp salt and whisk together. Whisk in warm melted butter (NOT HOT). Lastly whisk in proofed yeast mixture. In a large mixing bowl, add 2 1/4 cups flour then add wet ingredients. 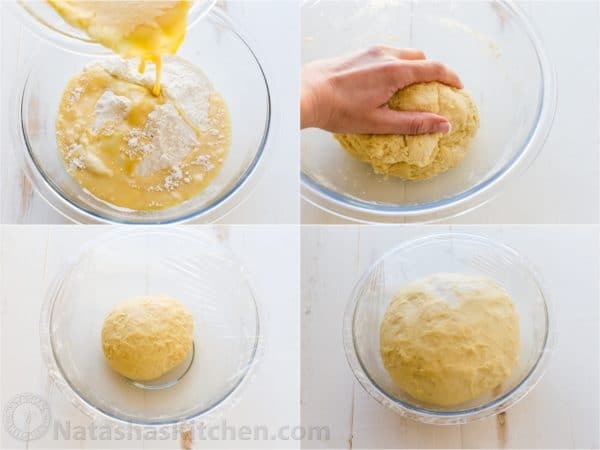 Combine dough with a spatula then knead by hand 10 min. Dough will be soft and not sticking to your hands. Form dough into a ball then cover bowl with plastic wrap, and let rise at room temperature 1 1/2 to 2 hours, until doubled in size. Meanwhile, make cheese filling: In a medium bowl crumble farmers cheese with a fork. Add 1/4 cup sugar and 1 egg yolk. Use spatula to blend until combined and somewhat creamy. Add diced apricots and 2 tsp orange zest. Once dough has risen, punch it down and transfer to lightly floured surface. Roll dough into 12"x9" rectangle, between 1/8" and 1/4" thick. Add cheese filling and spread evenly leaving a 1/2" border at the edges. Roll dough into a log starting from the long end and pinch edges to seal. Cut the roll in half to split into 2 strands, keeping them attached at one end. Overlap the 2 strands starting at the connected end and weaving them together towards the ends. Pinch the ends to seal. Carefully transfer braid cut-side up to a greased loaf pan. Cover with plastic wrap and let rise/puff up at room temperature 30-45 min. Beat 1 egg with 1 tsp water and generously brush egg wash over risen loaf. Bake in center of oven at 350˚F for 35 to 40 min, or until a toothpick comes out clean. Let rest 5 minutes in pan then transfer to wire rack. Dust warm bread with powdered sugar. Once cooled to room temperature, slice and serve. Looking for more traditional Easter Recipes? We go big on Easter because it is a major holiday as it marks the resurrection of Jesus and the victory and life that we have in Him. We spend the morning in church and then have a big celebratory potluck dinner at church. 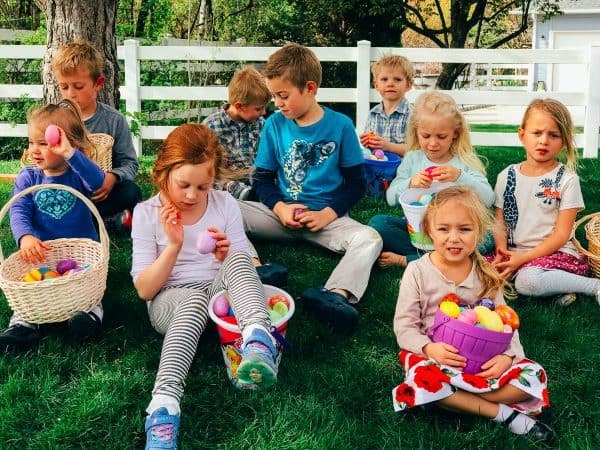 The day is wrapped up with an egg hunt for all the kiddos in our family at my parent’s house which they really look forward to. I would love to hear about your Easter traditions in a comment below! Have a happy and blessed Easter, my friends! What I meant is that you were able to successfully convert grams (I saw the original video recipe) to US cups. 🙂 That takes some work! Hi Nadia, check out our post on measuring flour. 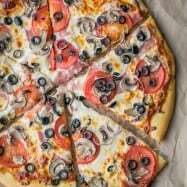 The way you described the dough definitely sounds like there was too much flour. The post should help. 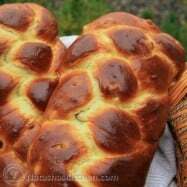 If we do not have the time to make farmers cheese since I would like to prepare the bread for Saturday. Which farmers cheese can we get from the store? We celebrate Resurrection Sunday as well with a brunch after service! Jesus lives! May you have a blessed day.